When I first decided to launch this company, it was largely motivated by my love of science, the endeavor itself, and the benefits, both short and long term. Libraries had robust collections and were receptive to publications in fields that were new and promising. I like to remind myself that it took two years to launch AIDS Research and Human Retroviruses as a quarterly; that’s how new the field was, and long before AIDS was determined to be a threat to public health. Support for science is worrisome, perhaps more than ever. Most legislators do not understand the need for basic research. They favor research that has a promise for clinical application. The March for Science in Washington, however, brings together scientists from many disciplines: basic and applied, biomedical research, climate and the environment, physical research, and on it goes. Will a march make a difference or is it primarily a feel-good collective experience for those engaged in scientific pursuit? Like other marches, it is exciting and will get some press. How it effects funding decisions remains to be seen, but a strong message needs to be made to the new Trump administration. We love the idea and have created GoGreen Shoelaces for Science™, neon green shoelaces to be worn not only at the march but whenever you are out and about. They make a statement! Do you have yours? We are giving laces not just to scientists, but also to librarians and advocates. Whether you wear them during the March or after, they will get attention and enable you to talk up the benefits of science. The shoelaces are free and you can request several pairs for colleagues, friends, and family who strongly believe in the scientific enterprise. Please be sure to spread the word, email GoGreen@liebertpub.com for additional pairs, and share your photos on social media with #LaceUpForScience—feet first of course! As the end of the fiscal year for many draws near, there may be opportunities to make changes or additions to your collection. Consider the purchase of perpetual access to the back files of your Mary Ann Liebert, Inc. journals. We offer flexible purchase options—you can select from a core journal collection across subdisciplines including Biomedical Research, Clinical Medicine, Environmental Studies, Technology and Engineering, or you can build a custom collection specific to your needs. Reach out to your Sales Representative or contact us to learn more today! We are excited that this year’s #ToteVote2017 campaign is off to a smashing start! 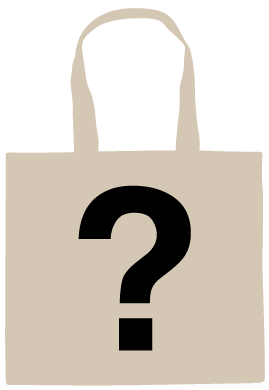 Librarians from around the world are voting on our design for this year’s tote bag design. 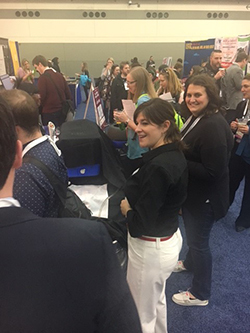 Votes were tallied at ACRL in Baltimore last month, and we look forward to logging more at Medical Library Association in Seattle and the Special Libraries Association meeting in Phoenix in June. Not attending the meetings but want to vote? No problem! Our online polls have no lines! But don’t wait too long, the polls close on June 30, 2017. We’ll announce the winning design in our Summer 2017 edition of Liebert Link and all voters will receive a tote! Host A Publishing Workshop at Your Library! Schedule your on-site scholarly publishing workshop presented by a publishing professional from Mary Ann Liebert, Inc., publishers. Publishers and librarians share a common goal: to service researchers and faculty. Mary Ann Liebert Inc., publishers would like to invite you to learn about the entire process of scholarly research publication from the publisher’s perspective. We are pleased to offer you the opportunity for us to visit your campus to present an insider’s perspective on the journey from submission to publication and discovery, and share insight on how our collaborative efforts facilitate the dissemination of scientific research that is conducted on your campus. Page production—images, figures, tables, supplemental info, etc. This onsite workshop will give you and members of your staff the opportunity to enrich your understanding of the process you can, in turn, convey informed assistance to the researchers and faculty at your institution. Your customized workshop can run from 2–3 hours and will include coffee and refreshments as well as a robust Q&A and reference materials. 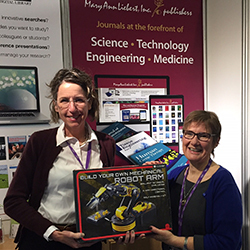 Please contact us for a chance to be selected for a personal visit from Wendy to YOUR campus for an educational visit and presentation to your library and faculty colleagues on the publication process. 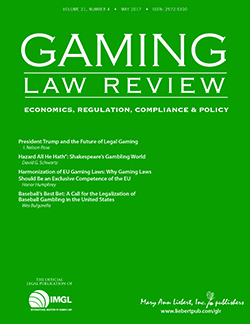 Beginning with the May 2017 issue, Gaming Law Review and Economics will be published under a new title: Gaming Law Review. For more information, contact your Sales Representative. 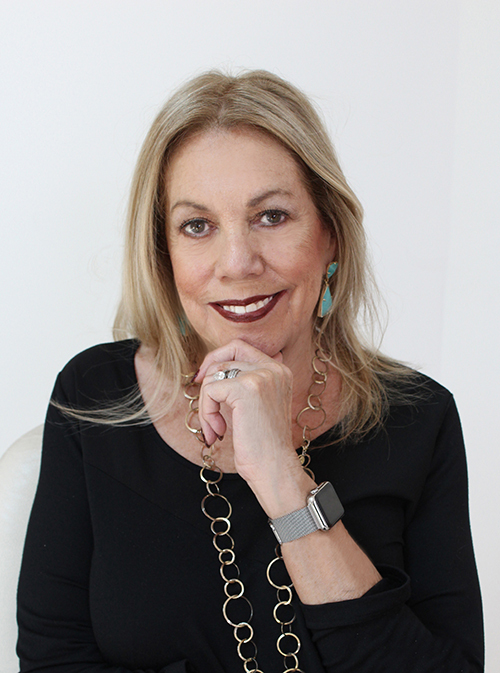 In addition to getting a new title, In January 2017, Sue Schneider was appointed Editor-in-Chief of Gaming Law Review and Economics. 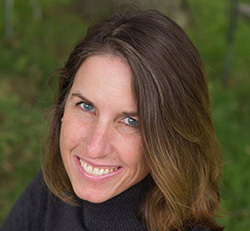 She is one of the world’s leading experts on the internet gaming industry. Schneider is a frequent speaker at international gaming conferences and has testified to the US Senate, the US House of Representatives, as well as the National Gambling Impact Study Commission in that country. Greetings from 30,000 feet above England where I’m flying from Boston, through Heathrow to Leeds, then onwards to Harrogate to attend UKSG. As I boarded my flight, I saw two scholarly publishing compatriots from the US whom I know from attending the many conferences I’m lucky enough to attend every year. This is spring in scholarly publishing, and it is glorious! Sure, I boarded a plane in Boston at 10:40 p.m. on Saturday evening, flew overnight in the middle seat in the third row from the very back of the plane, but this is the season that makes our world great. We come together in various groups to discuss our ever-evolving business market, to learn from each other, and dare I say, even become friends. In fact, I have several friends from scholarly publishing that I consider to be the dearest in my life, largely as a result of the many years of sharing the same trials as we progress the dissemination and distribution of scholarly research. We are one in the near-herculean effort of providing swift publication of critical results that will benefit science, society, and culture in many ways. What we do is important, and the ongoing conversation to support, escalate and expedite our work develops an indelible bond. While we’re not exactly a band of brothers on a battlefield, staking our lives for our crusade or our country, the relationships we develop over the course of our careers are deep and strong. These meetings that we attend every year bring all of us together to conduct important conversations. Meanwhile, while we’re not even noticing, we become part of the fabric of each other’s lives and careers. We’ve navigated evolutions in nearly every facet of the business—online submissions and tracking; electronic proofing; and of course, the adjustment to online publication. And the field of play continues to shift with countless ongoing developments. We fight off acquisitions and even pirates—we’re warriors on the battlefield of scholarly publishing. Technology has provided significant advances in the way we distribute content. What used to take months, or even years to review, revise, copyedit, compose, print, bind, and mail, now takes a matter of weeks…or even mere days. Technology has even eliminated the need to talk directly to each other since the vast majority of our communication is done via email. Yet we still gather in a common space for several days to talk with each other about the evolutions that we are trying to promote, along with those we’re trying to resist. Conferences provide a space where everyone is exposed to each other —we wantonly convene to be a part of the conversation, or as is often the case, drive the conversation. We peruse the hall and talk to exhibitors and vendors, take meetings, and listen to innovative presentations. And we network. It’s so important to know people in publishing because really, it’s what makes this field so wonderful. And through this networking we build our businesses, push our agenda, collaborate on projects…and we make friends. Wonderful, lifelong friends that become a part of our lives and for that we all thank publishing and ALL that it has done for us. So, as the British landscape slips by below me, and we descend into Leeds and Harrogate beyond, I’m anxious to take part in my first UKSG conference. To meet new people, and see many dear friends that I’ve known for years. 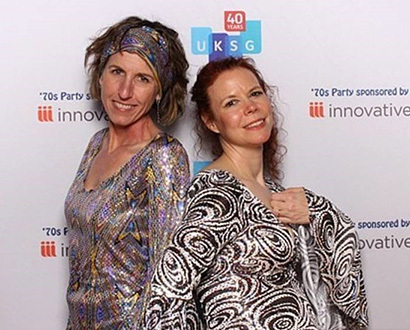 We’ll meet, learn, eat, drink…and even dance through the week and, as a result, our businesses will grow, and our lives will be richer, because we meet, face-to-face. The Integrative Medicine Collection from Mary Ann Liebert, Inc. is essential for all medical libraries, hospitals, and Schools of Oriental Medicine, delivering authoritative evidence-based research and clinical coverage of the use of integrative medicine to advance human health and well-being. 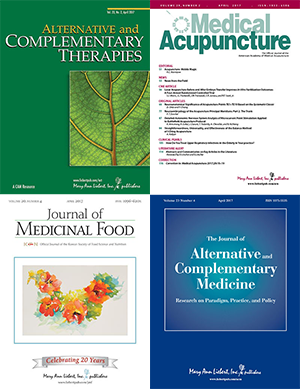 It includes these esteemed, groundbreaking publications: Alternative and Complementary Therapies, The Journal of Alternative and Complementary Medicine, Journal of Medicinal Food, and Medical Acupuncture. Contact us to learn more about adding these journals to your collection. As Wendy said in this issue’s “Sales Call!”, spring kicks off conference season for publishers and librarians alike. Our teams have been spanning the globe, meeting with libraries, librarians, researchers, and societies. 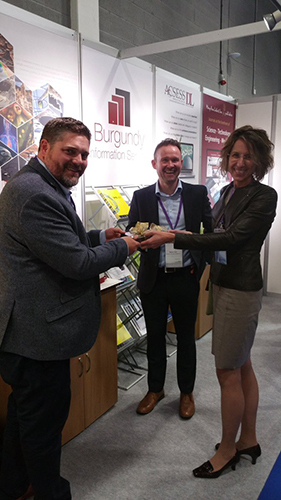 Wendy Newsham congratulates our regional representatives, Burgundy Information Services, on their 10th Anniversary at UKSG! 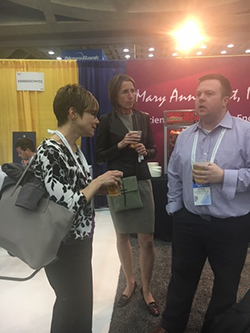 Thank you to all who joined us in Baltimore for our in-booth reception; we apologize to our aisle-mates for the congestion!